Keep your favorite backseat buddy in the back. 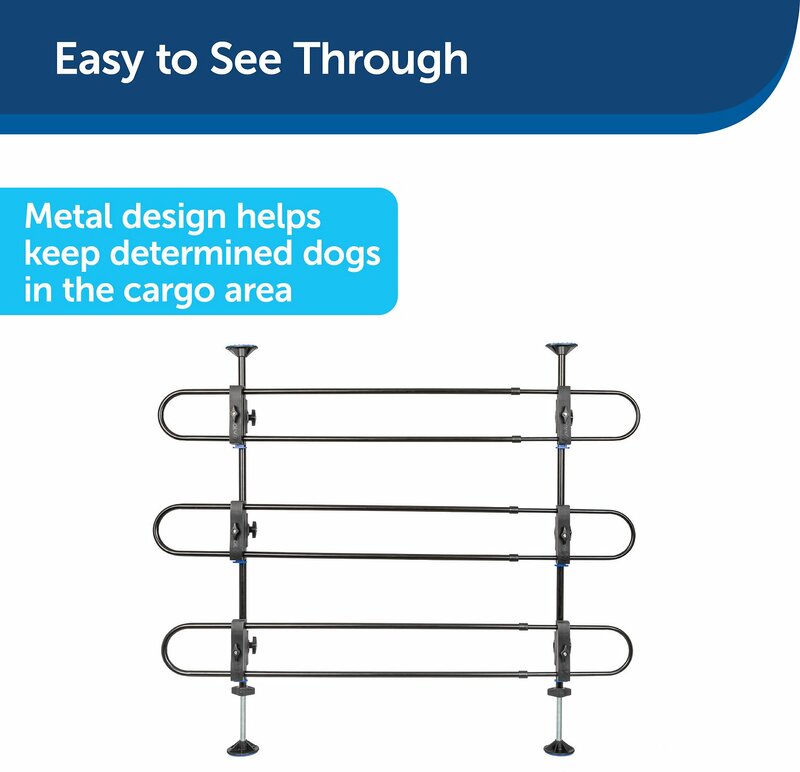 The Solvit Deluxe Tubular Car Barrier reduces distractions when you travel with your dog. 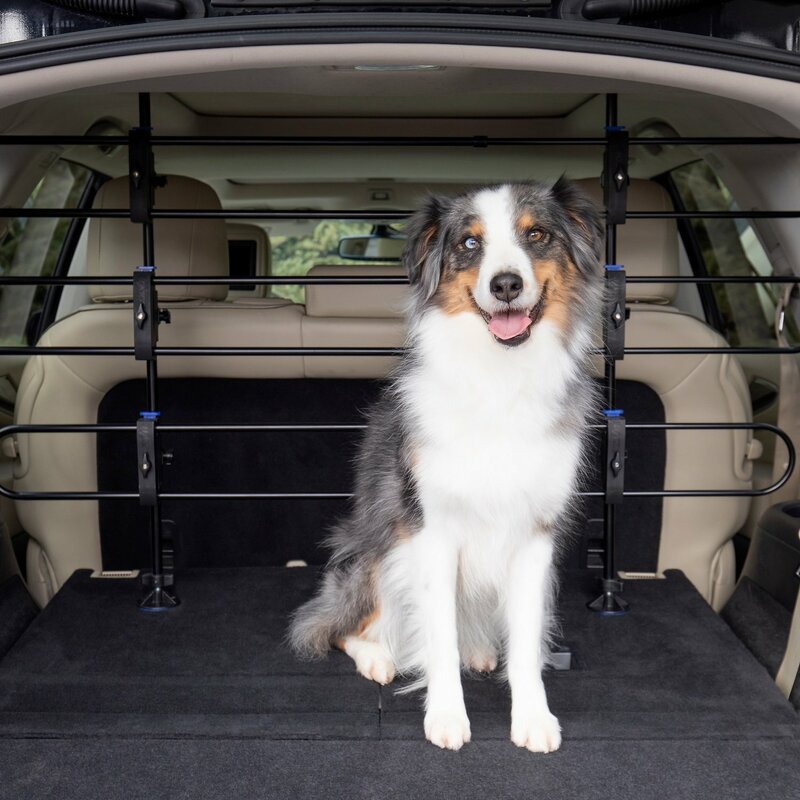 The Solvit Deluxe Tubular Car Barrier improves safety by keeping your dog in the back, thus reducing driver distraction. Special features eliminate the annoying rattling sound that comes with other designs, so you can enjoy a truly peaceful trip. Many barriers have a hard time staying in place, but Solvit’s design includes rubberized top and bottom caps to firmly grip the floor and headliner and prevent slipping. Quick-connect clamps allow easy removal of the horizontal tube sections for quick access to the pet or cargo area. This feature also allows you to un-install or re-install the barrier in under one minute. When it’s not in use, the barrier stores safely in its own stuff sack. The universal design adjusts from 32 to 49 inches high and 33-57 inches wide to fit almost every vehicle, including smaller SUVs and Crossovers. Improves safety by reducing driver distraction. Includes three expandable oval tube sections with a special feature that eliminates rattles that plagues other designs. Rubberized top and bottom caps prevent slippage. Can be un-installed/re-installed in less than one minute. 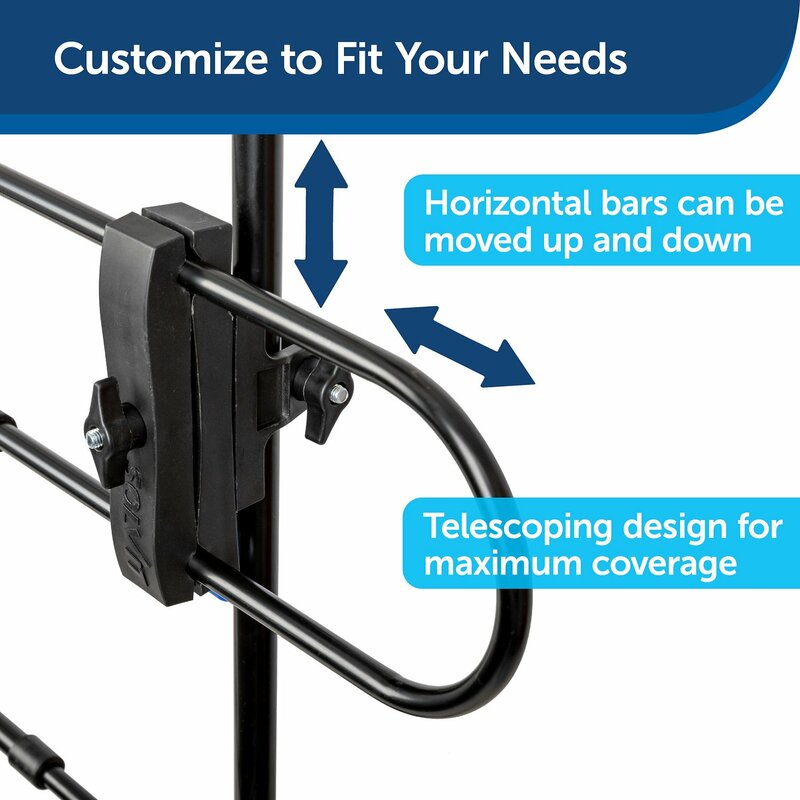 Quick-disconnect clamps allow horizontal bars to be removed easily. Adjusts from 32 to 49 inches high and 33-57 inches wide to fit most vehicles. This product is recommended for larger pets. Smaller pets may be able to squeeze past the barrier. Received barrier in three days in good condition,assembly directions were easy to follow and completed in about 45 min. had to place 3inch spacers under the vertical bars because my minivan has tall head room. ( Chrysler town and country ) It is good and stable for our 95 pound bloodhound. I have had these barriers 10+ yrs, this one is my newest replacement as the original was left on the east coast by accident when we moved to the west coast. I had to buy another because even though my dogs ride well with seatbelts in my jeep, we adopted a new rescue to our pack of 4 and need to intro him slowly. This barrier is super easy to install and very versatile and durable. Im 5'5, 105, with 4 60 lb pitties. Great price and i like the grippers on the footholds. Fits into my jeep frame perfectly even if i take the t-tops or hard top off i dont have to necessarily remove it. Great for safety! I preassembled in the house and with just a bit of adjustment and tightening it went right in. Working as it should. Needs a little tighening from time to time to stop any rattling. Works well, once you can get past the lousy instructions. The instructions leave out a few key points, like how to mount the uprights. How to set the adjustments so they lock in. Once you get past that, it works well but it tool three days to figure it out. I have a big baby who is sure that he needs to help me drive! With the barrier I can go without his help and that means I don't always have a second human go with me! And I can drive without his help! I absolutely love this barrier!!!! Was perfect for my two large labradoodles. Took A few minutes to assemble but it’s so easy to remove and set back up in my suv when I need it. My German Shepherd is contained in my SUV and she's okay with it. She's able to be pet and she stays put. It took about ten minutes to install. No tools. I would recommend using a level to make sure the bars are even. Or you can eye it. Are you kidding? 53 individual parts. Your instructions are terrible. What’s a tube clamp, what’s a bracket? The name “solvit” implies you solved one of my problems but this product creates problems, too much work and frustration. I've had this installed in my Subaru Outback for about a year and a half and I recently noticed it has caused the headliner to separate along two seams in the back. You have to crank it in there really hard to get it to stay in place and I was afraid from the start that this would happen. Well, it finally did. Otherwise it has been OK, and I think this would be a problem with any of the others that share this same basic design.